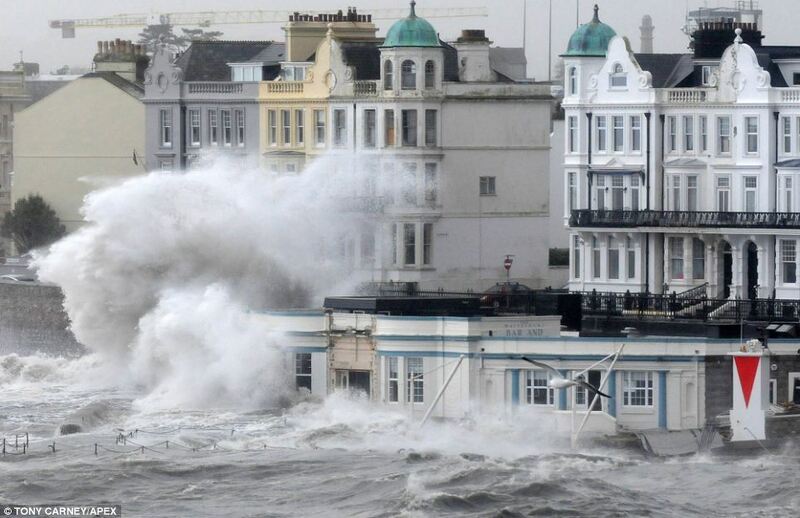 A new Atlantic storm is set to batter parts of Britain's beleaguered coastline this weekend with huge waves due to bring further devastation to the south west and heavy rain expected to heap even more chaos on to flooded communities. The weather system is expected to bring up to 30mm of rain overnight tomorrow and into Saturday along with severe gale force winds of up to 80mph which could topple trees and cause more damage to southern Britain. 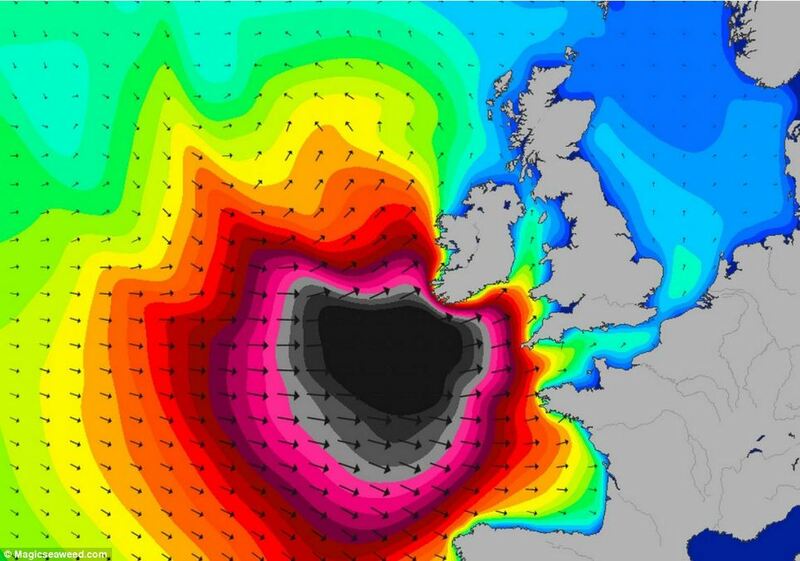 Experts meanwhile have predicted waves of up to 35ft could batter parts of the Cornish coastline on Saturday - the biggest seen this winter. Two new turbulent weather systems are expected to hit the country throughout the next few days with heavy rain and gale force winds set to continue to batter large parts of southern Britain today, leaving many areas at risk of further flooding. Met Office forecaster Kirk Waite said: 'The real thing with the second system is the strength of the winds. 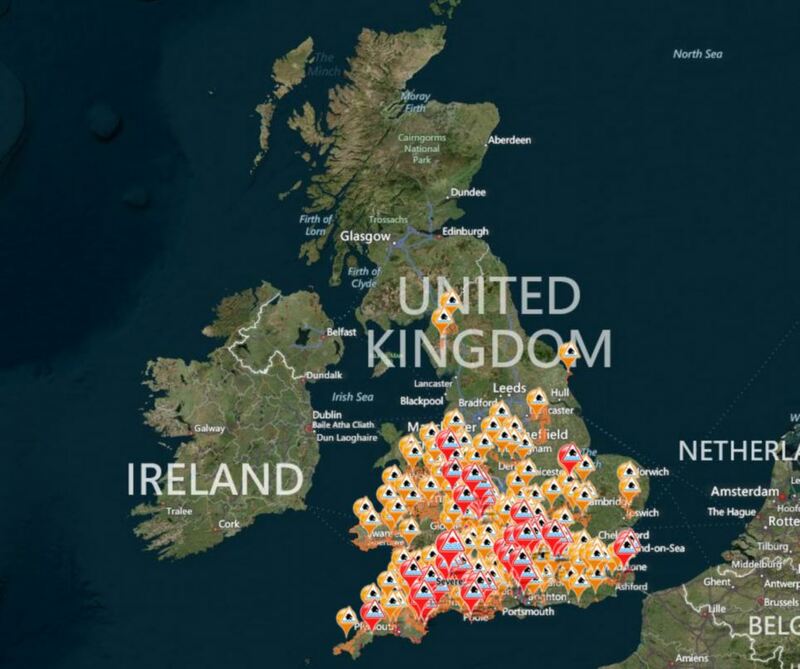 People living in the Somerset Levels were today set for further misery as two severe flood warnings remained in place, signifying a danger to life. 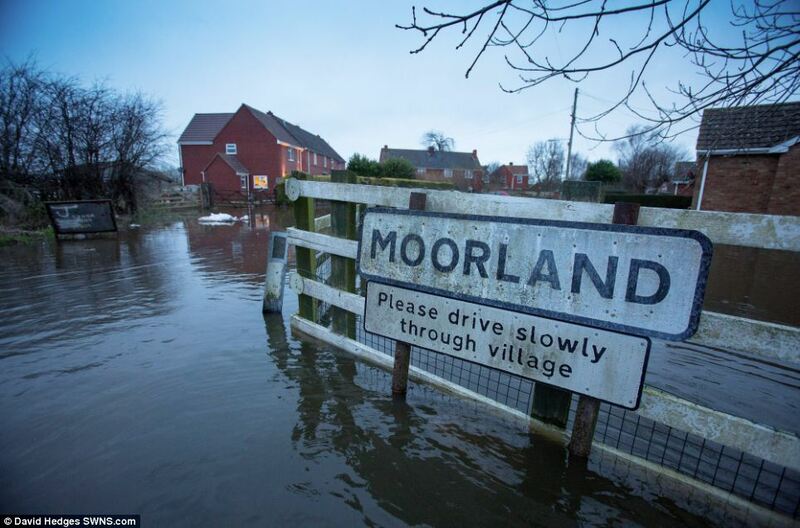 The Environment Agency said the first warning affects the Salt Moor and North Moor while the second is in place on the A361 between east Lyng and Burrowbridge, including the Somerset Levels Basket and craft Centre Area. 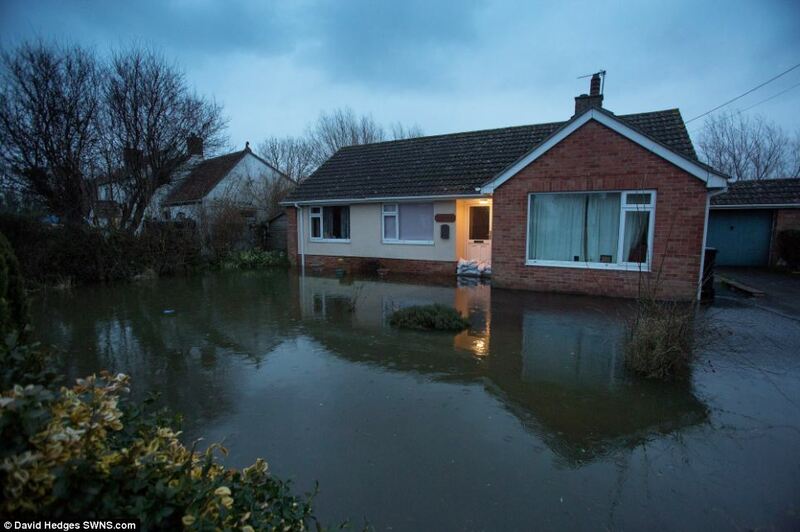 Many flood-hit homes on the Somerset levels have already been evacuated, and further rainfall raises the prospect of more residents having to leave their houses. A number of residents however have reportedly refused to leave their homes because of the fear of looting. 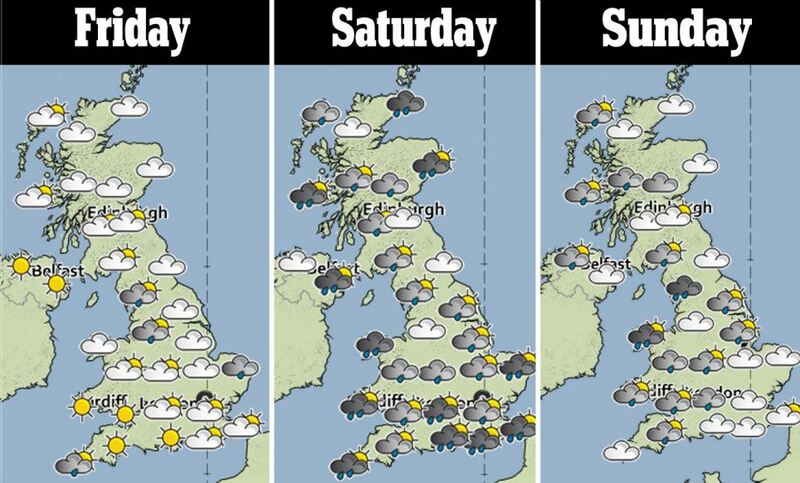 The Met Office warned that a fresh wave of heavy rain was due to hit southern England and Wales at around 6am today. They said up to 1.6ins (40mm) of rain is being predicted to fall in the south coast, where many areas are already drenched from recent storms and floods. Upland areas including Salisbury Plain, South Downs and North Downs are set to be the worst affected by the downpours, and the Met Office has issued an amber warning in these parts urging locals to 'be prepared'. A yellow warming for rain is in place across the rest of southern England and Wales meaning that people living in these areas should 'be aware'. And winds of up to 40mph are set to batter the south coast, potentially bringing dangerously high waves and wreaking fresh damage to these storm-hit areas. Communities Secretary Eric Pickles has said that the severe weather had caused damage to the transport network and sea defences as well as power lines. Mr Pickles told the Commons that the Government would provide £130 million for emergency repairs and maintenance. Prime Minister David Cameron will chair a meeting of the Government's Cobra emergency committee later today, Mr Pickles said. 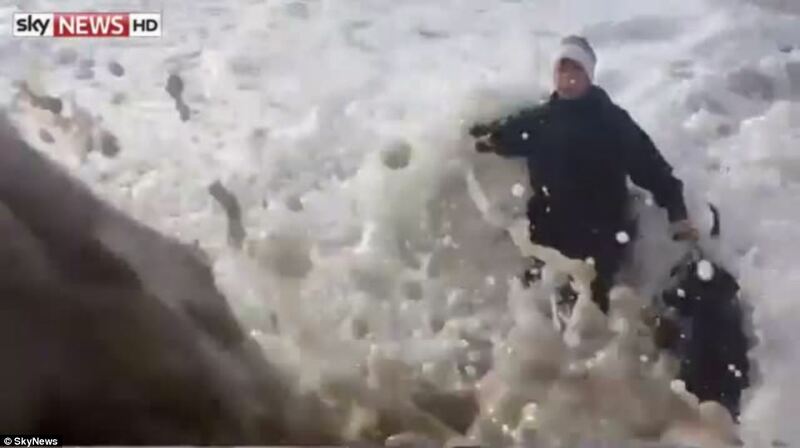 According to the Metro, a 75ft wave was recorded by a buoy close to Penzance. National Oceanography Centre experts have been trying to confirm the data, but if it is verified it could be the biggest wave ever recorded off the British Isles. 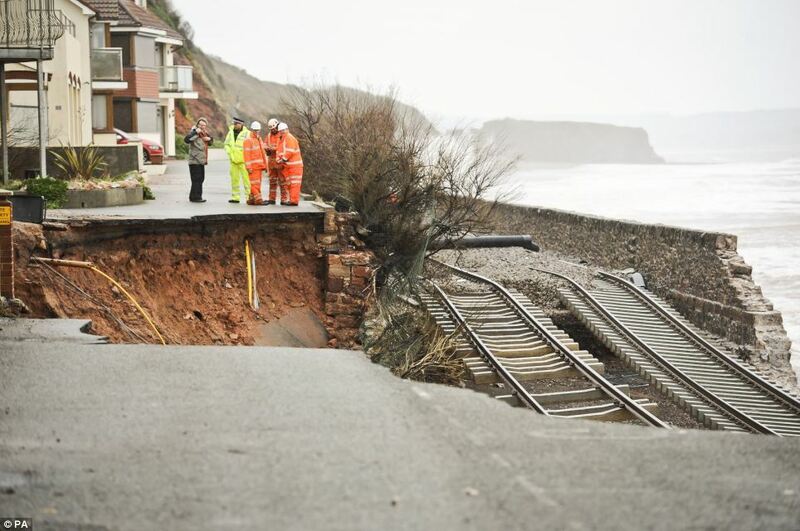 A stretch of railway track in Dawlish, Devon, has already been destroyed because of storms and experts are warning that further destruction could be on the way. Speaking to the Today programme, Robin Gisby, managing director of network operations at Network Rail, said the train link will take weeks to repair. He added that the 80m hole in the wall which separated the train tracks from the sea had left the rest of the line exposed, and that it was all Network Rail could do to stop further damage. 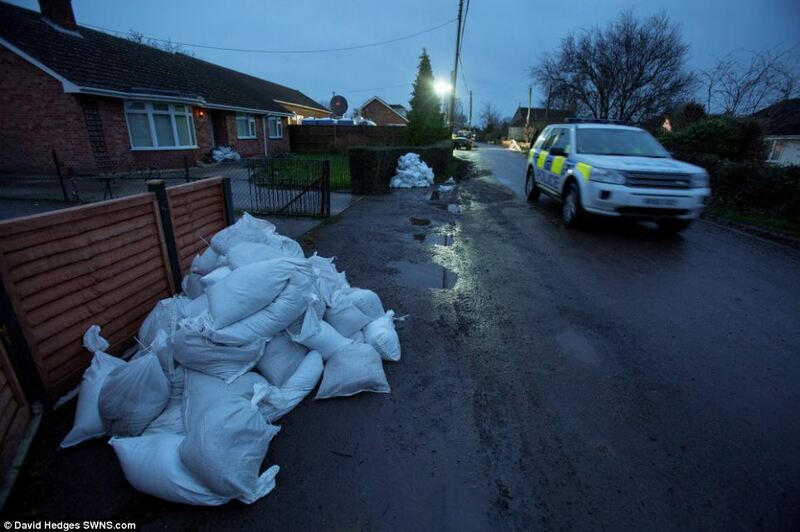 Pete Fox from the Environment Agency meanwhile said people face a 'conveyor belt of storms'. 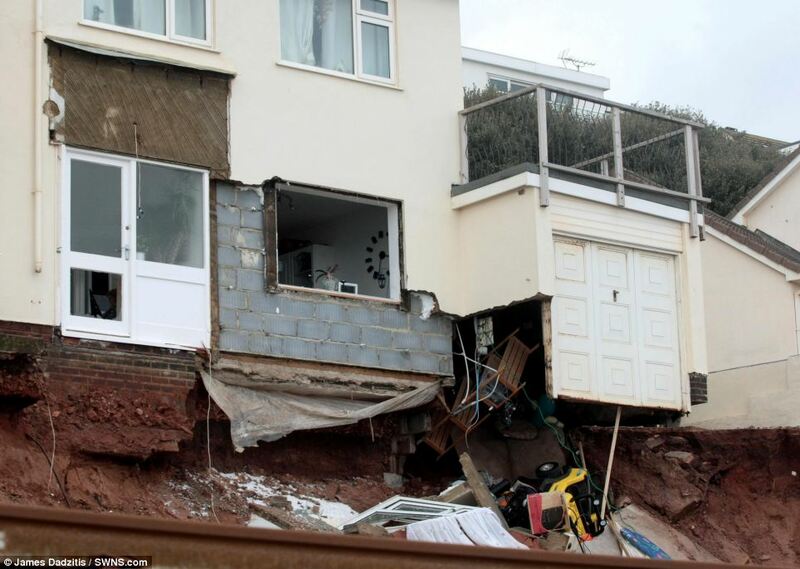 Regarding sea walls in Dawlish, Devon, he told BBC Breakfast about 'the difficulty of dealing with a tidal situation where the tides are progressively coming in again and again'. High winds are expected to lash the Channel tonight into tomorrow, potentially causing disruption to the popular ferry crossing route. And there is little respite from the turbulent weather as, after a brief spell of sunshine tomorrow morning, fresh storms are set to hit. A weather system developing off the Atlantic will sweep into Britain bringing up to 1.2 ins (30mm) of rain overnight tomorrow and into Saturday. Severe gale force winds of up to 80mph are expected to hit southern Britain which could topple trees and cause more damage to the beleaguered region. 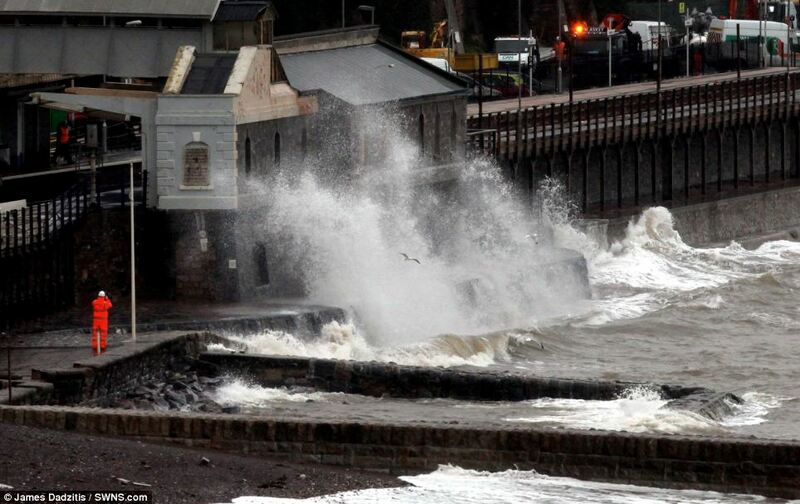 Transport misery worsened for the people of Devon and Cornwall today, as it was revealed a vital train link battered by stormy seas will take weeks to repair. The added that the 80m hole in the wall which separated the train tracks from the sea had left the rest of the line exposed, and that it was all Network Rail could do to stop further damage. The warnings come as it is revealed that environment secretary Owen Paterson will not chair a meeting of the Government's Cobra emergency committee today. The minister, whose response to the flooding crisis has been criticised, is to have surgery for a detached retina in his eye. It is understood that communities secretary Eric Pickles will stand in for him. David Cameron has defended Mr Paterson's handling of the flooding crisis, insisting he was 'absolutely on top' of the issue. In an interview on BBC Manchester, the Prime Minister insisted the Government had been 'very proactive' in putting its emergency planning procedures into action as soon as the stormy weather hit. When presenter Mike Sweeney questioned Mr Paterson's decision to view flooding in Somerset 'dressed for a ball at the Ritz, without his wellies', Mr Cameron responded: 'I completely disagree with what you said about Owen Paterson, who knows a lot about rural issues and the countryside. He sits for a rural seat. He is absolutely on top of those flooding issues. 'He went to visit the floods. He was not dressed as if he was going to the Ritz, he was dressed as if he was going to floods. He had a pair of wellies, but because he was harassed as soon as he got out of his car, he didn't have a chance to put them on. He didn't forget. The PM was critical of the Environment Agency's decision to cut back on dredging rivers over the past two decades. 'The fact is, since the Environment Agency was founded in the late 1990s, it took a view - and increasingly other organisations took a view - that dredging wasn't appropriate,' he said. 'I think that's wrong. I have a constituency that does flood frequently. I pushed for dredging and some dredging has taken place and it does make a difference. The damaged railway line at Dawlish meanwhile is costing the regional economy 'tens of millions of pounds' every week, Labour's shadow transport secretary said today. Mary Creagh urged the Government to set out a long-term plan to protect Britain's rail infrastructure from future damage after storms battered the South West. Speaking during transport questions, she said: 'Freak weather is rapidly becoming the new normal in our country, and I understand the difficulties you have in giving a timescale for the Dawlish repairs, given further bad weather is forecast for Saturday. He added: 'I'm sure the whole House will want to join me in expressing sympathy to all those affected by the extreme weather conditions. 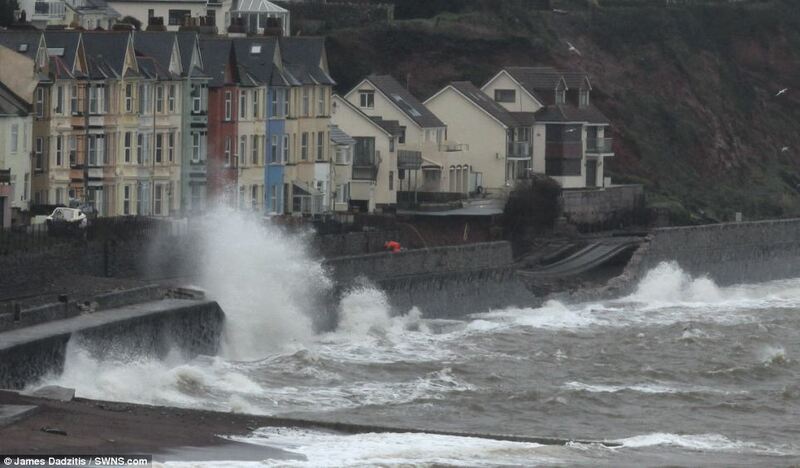 'An urgent priority is the railway at Dawlish. Colleagues will have seen the images of the devastating impact the weather has had on the railway there. 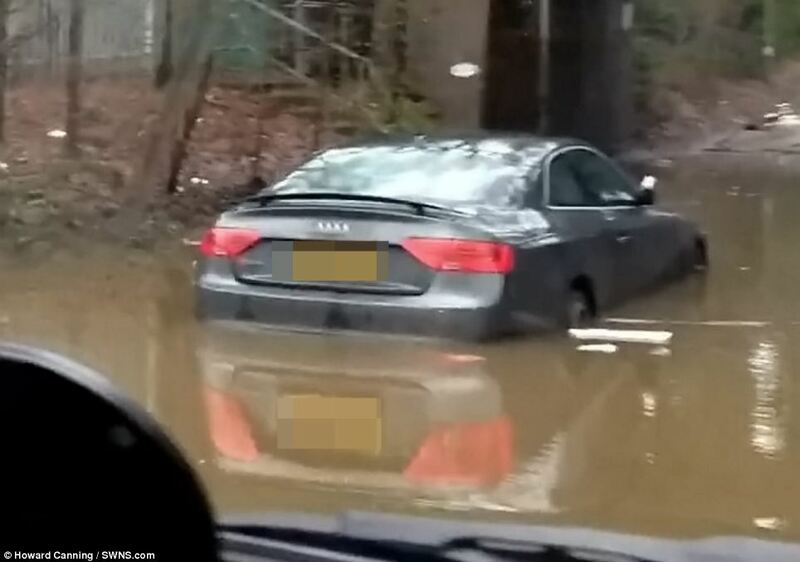 Pictures have emerged of all that is left of a £60,000 sports car, abandoned by its owner when its engine stopped on a flooded road, after it was 'ripped to shreds' by thieves. 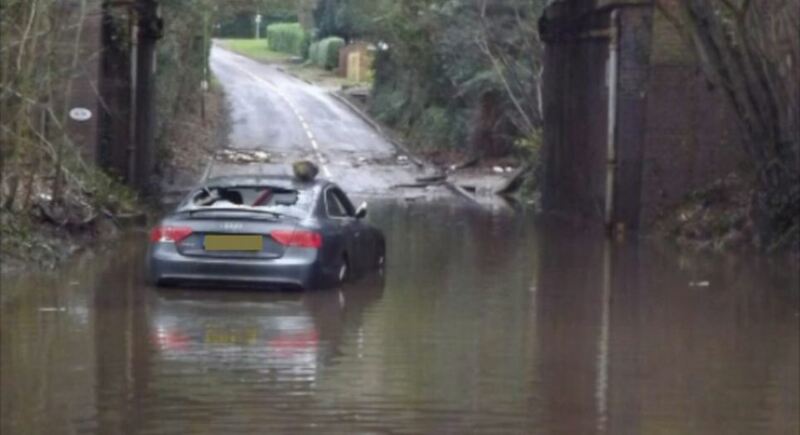 The 4.2 litre Audi RS5 was ditched on a road near a railway bridge approaching the M25 in Chertsey, Surrey, last month. 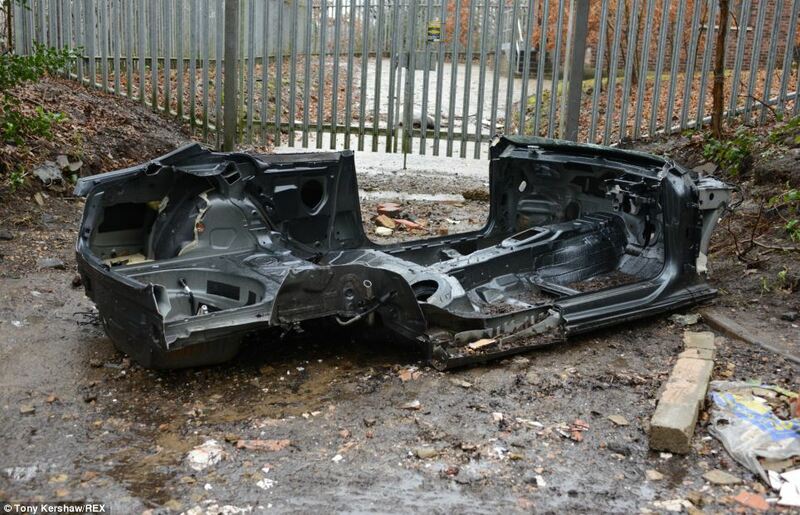 In the past two weeks the grey car, which would have cost £58m350 when new, has been stripped to just a shell by vandals. 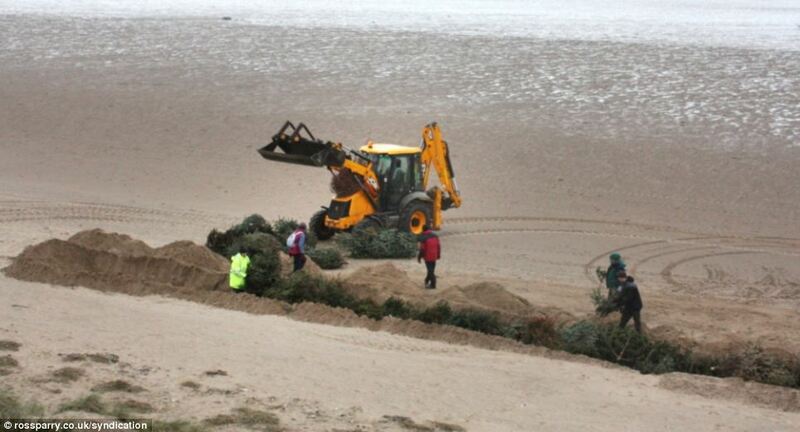 Council bosses in Fylde, Lancashire, trying to protect their coastline have saved hundreds of Christmas trees from the woodchipper and used them as sea defences. 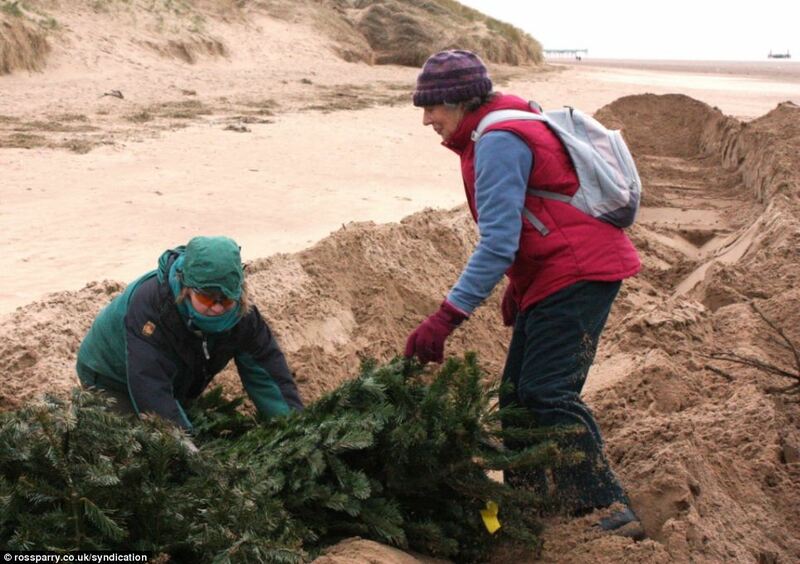 A team of ten volunteers turned up to help council staff bury hundreds of discarded trees, which are being used to reinforce the sand dunes. The measures will also help protect vulnerable homes and coastal roads by reducing the amount of sand blown into the highway from the beach. 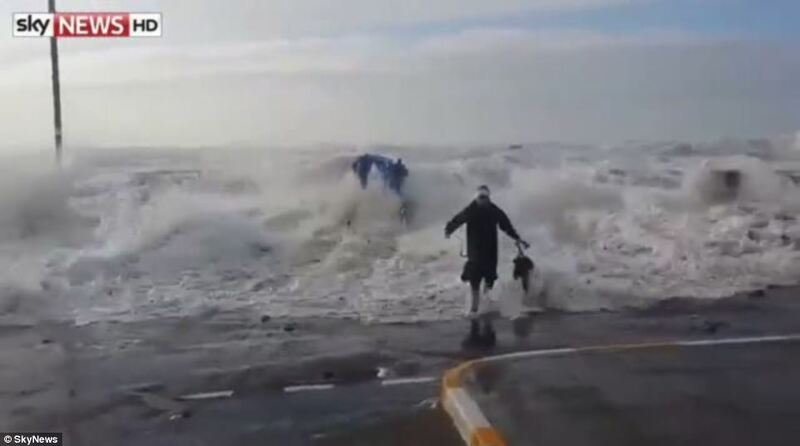 A five-mile stretch of coastline along the Fylde Coast will benefit from the defences. 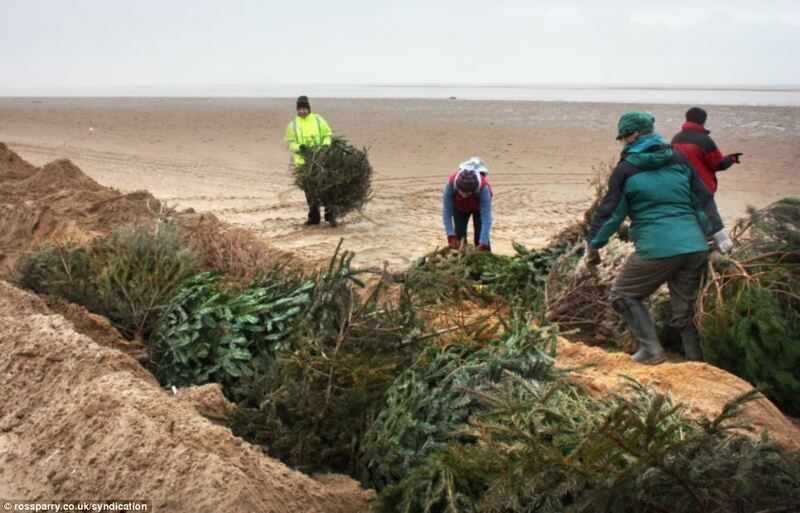 Recycling staff at the council collected more than 700 trees this year and although some were sent to the wood-chipper, hundreds have been used to boost the sand dunes. A monument in Highland Perthshire has been felled by the rain after standing for almost 6,000 years. Days of downpours proved to be too much for the Dane's Stone, which is believed to date back to the neolithic era or Bronze Age. Householder Marianne Carruthers said she heard the stone hit the ground from over 50 metres away as she sat in her home in Moulin, near Pitlochry. She said: 'I went to the window but couldn't see anything. Half an hour later that I noticed something was amiss and the stone just didn't seem to be there anymore. The impressive quartzite monolith was not damaged by the fall. Mrs Carruthers said that it seemed to be balanced on a pile of smaller stones. She added: 'My son went over to have a closer look and he thought it had fallen over because of the wearing away of the soil. Regarded as a scheduled ancient monument, the Dane's Stone stands at almost 2m tall and boasts a rich history. Weather: Rainy with thunderstorms, snow over 1300 m.